We contact you to set up an initial phone consultation (one person or whole group). We develop a first draft itinerary. Several variations are made until the perfect itinerary is reached. Prior to going to contract we have our office in Arusha run a comprehensive availability check on all accommodations and request provisional bookings. If all accommodations are available, you are sent a final contract/itinerary for signing and your deposit is due (see Terms & Conditions). If availability is not possible at some of your desired locations, we seek out alternate options prior to going to contract. Once you sign and return your contract, our office in Arusha submits booking vouchers and makes necessary deposits to all the accommodations to finalize the bookings. Signed and stamped booking vouchers are scanned and emailed to you as confirmation of your bookings. When booked well in advance (6 months or more), there is usually no problem in securing all the desired accommodations. However, when we encounter full locations, we place immediate bookings at alternate locations and then, time permitting, present these options to you for a final decision. Typically, we have been very good at getting excellent locations, even last minute. While it is true that many lodges do indeed fill up quickly, we find that rooms usually open up as the date gets closer due to the release of rooms from block bookings. It is common for large tour operators who organize group tours to book a block of rooms in anticipation that their pre-­planned itineraries will operate at full capacity. Many lodges allow block bookings without deposit, but force the tour operators to pay for these rooms or release them as the actual dates get near (between 45 and 60 days in advance). What does this mean for a private tour? It means that sometimes it can be difficult to secure certain accommodations that cater to group tours. All domestic and/or chartered flights. Unlimited and exclusive use of a 4­wheel drive safari vehicle & driver while on safari. Your vehicle will be in excellent condition and have a pop­-open roof for 360 degree game viewing. It will also have a radio so your guide can communicate with other guides to find the best viewing locations. 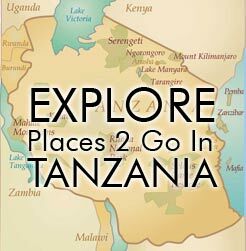 Expert & Experienced Tanzanian driver/guide (English­-speaking) with vast knowledge of Tanzania and its wildlife. On camping safaris the price includes camping fees and a cook who will not only prepare delicious meals, but will also set up and take down camp each day while you are enjoying the days’ activities. Equipment includes high quality all­-weather tents, sleeping bags, pillows, camping mattresses, and portable table, chairs, and washstand. Most campgrounds have communal restrooms with showers. Some have hot water.